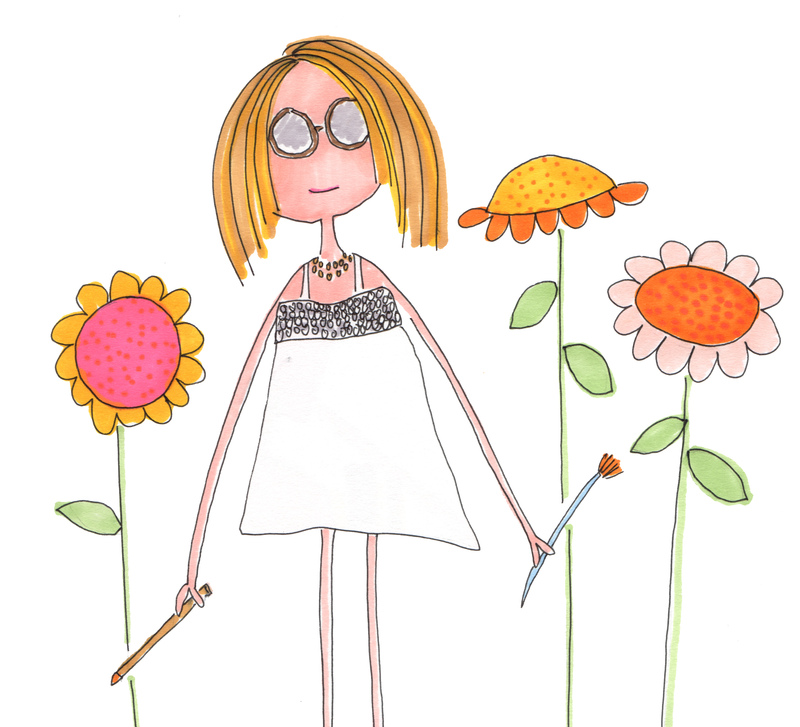 What do you get when you combine a lifelong love of art with three daughters, two dogs, and a packed mom-centric schedule? An illustration business that’s founded on passion and intuition! We’re excited to feature Kamie Rudisill as October’s artist of the month. Kamie is the owner of Dizzy Daisy Designs, where she offers original illustrations, watercolors, and hand-written lettering services. Welcome, Kamie! Tell us a little bit about yourself: What got you interested in illustration? Throughout high school and college, art took the backseat, but I was always drawing and doodling, designing t-shirts, logos, posters, etc. for the various organizations in which I was involved. After college, I worked for several not-for-profit art museums, where I was the jack-of-all-trades (invitations, newsletters, logos, and the like). It was here where I started to learn the computer skills needed for designing. Dizzy Daisy started not long after the birth of my third child (all girls), when the search for a "bouncing fairy" party invitation turned up dry. My 6-year-old suggested that I make the invitation myself. I feel so blessed to be able to spend my days doing something that I truly love, and that I have been able to stay home with my girls. Balancing work and family is not always easy or pretty—in fact, it is often crazy and messy!—but I wouldn't have it any other way. I would like to say that most of my inspiration comes from my daily crazy life with three kids, two dogs and my occasional wanderlust for travel. But the truth is, the Internet is often the first place I go; Google and Pinterest are bottomless pits of inspiration for any project. My design crush is Suejean Rim. I love Sujean’s illustrations because of what I like to call her "whimsical realism” style. She draws from reality, people, places and things, and infuses a sense of fun and whimsy—not in a cutesy way, but with a hint of sophistication. You also offer hand-written lettering. Is that a natural-born skill, or did you study hand-lettering? I have been obsessed with handwriting since I was a little girl. I love to play with the shapes of words and letters and it just comes naturally.